Spiked Hot Chocolate is a festive cocktail perfect for the holidays, and you can easily whip up a quick batch for this year’s holiday party, or even make single servings for relaxing at home by the Christmas tree. If you’re not quite sure how much or what kind of booze you’d like to dress up your hot cocoa with this season, you’ve come to the right place! This is a homemade hot chocolate recipe made for spiking, and you can make it work with just about any combination of alcohol. Not sure which combo to use? See the list of boozey items below, all of which pair perfectly with chocolate. However, if you’re not ready to put on your mixologist britches just yet, take comfort in knowing you’ve got three stellar, ready-made alcoholic hot chocolate combinations to choose from: vanilla vodka and Kahlua, Baileys and Kahlua, or make it simple with whipped cream vodka! To make spiked hot chocolate, you would begin in a pot on the stovetop with your cocoa powder mix and a bit of water over medium heat. Once the cocoa mixture has liquefied, the dairy goes in. After the hot chocolate has heated through, it’s removed from the heat, add the vanilla extract (and peppermint extract, if using) along with the alcohol. Mix cocoa powder, sugar, salt, and water in a pot on the stovetop over heat. Add the dairy and bring to temperature. Remove from heat and vanilla (or peppermint) extract and alcohol. The trick to a good cocoa powder-based spiked hot chocolate is (hate to say it) fat. Heat tends to intensify the burn of alcohol on your palette. The fats from the dairy will help to counterbalance the burn. Using cream and whole milk, rather than let’s say a combination of half-and-half and 2% milk, will help to cut that overpowering, unpleasant burn from the alcohol, and produce a smooth and enjoyable spiked hot chocolate. If you’re in a pinch and you don’t have the cream, you can still use this recipe with whatever dairy you have on hand. However, I would suggest adding the alcohol in smaller increments to taste, rather than all at once if making a big batch. 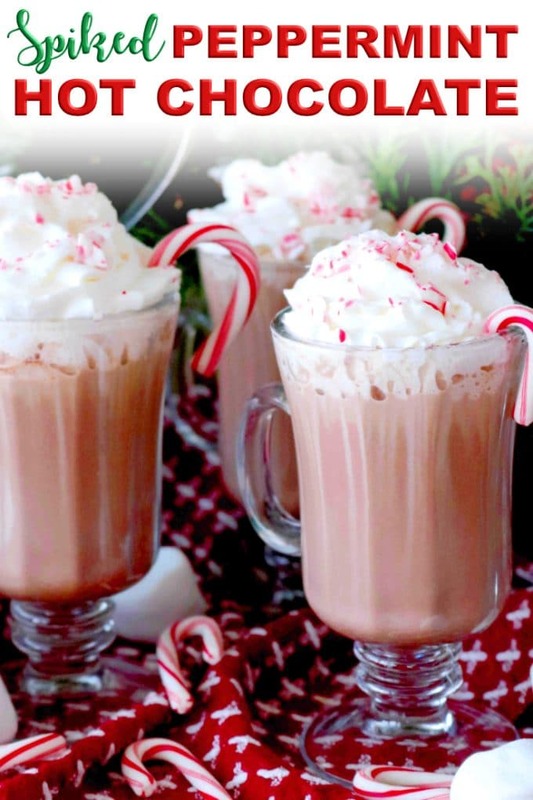 You can get really creative when it comes to spiked hot chocolate, and if you want to go out on a limb, do a little experimenting and create your own spiked hot cocoa recipe, below you’ll find a few different boozey options to choose from! 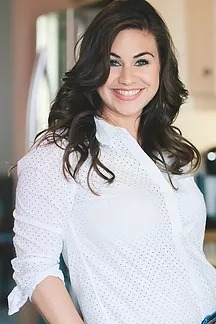 As a base for your cocktail recipe, for every 5 ounces of dairy, you’ll use 1 ounce of liqueur and 1/2 an ounce of liquor. Single Serving: Hot chocolate with Kalua and Baileys is also a popular combination. 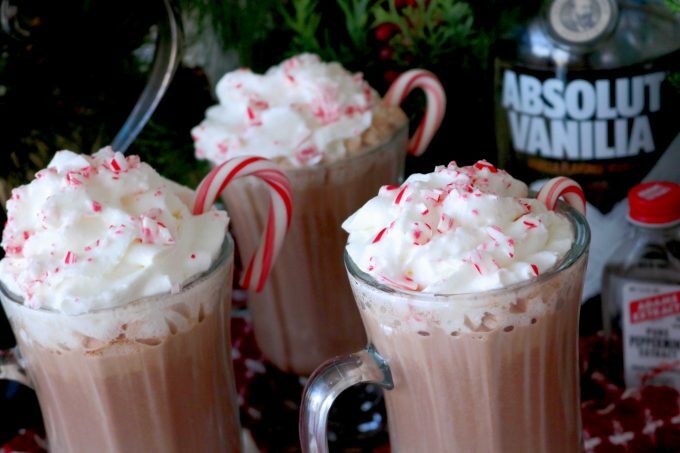 For this cocktail, you’ll add 1 ounce of Kahlua and 1 ounce of Baileys per serving of hot chocolate. A traditional hot chocolate serving is anywhere from 5-8 ounces, which is just under or right at 1 cup of liquid. Big Batch: For a big batch, follow the hot chocolate recipe located in the recipe card, omitting the vodka and Kahlua quantity it calls for. Instead, add a 1/2 of a cup each Kahlua and Baileys. Single Serving: To make an alcoholic hot chocolate with whipped cream vodka, add 1 1/2 ounce of whipped cream vodka per serving of hot cocoa. Big Batch: For a big batch, follow the hot chocolate recipe located in the recipe card, omitting the vodka and Kahlua it calls for. Instead, add 1 cup of whipped cream vodka. We make a few batches of my Williams-Sonoma copycat Peppermint Bark at the start of every Christmas season. The big shards are usually gobbled up fairly quickly, but inevitably we’ll be left with a few scraps come the end of the holidays, and the leftover bark goes in a container for a very special occasion. We host a potluck Christmas party every year, and we always provide our signature roasted beef tenderloin canapés and, of course, spiked peppermint hot chocolate. If you’d like to make alcoholic hot chocolate with your leftover peppermint bark, here is a simple method for doing so. I’m sure everyone’s leftover quantities will vary, so here is more of a method rather than a recipe for putting that peppermint bark to good use. Add your leftover bark to a large pot, and pour over just enough cream to cover the bark. Over low heat, and allow it to melt together. Add whole milk, cup-by-cup, until it tastes like hot chocolate! At the end, splash in 1 teaspoon of pure vanilla extract for an extra special touch. Keep track of how much liquid you add, as this will affect how much alcohol goes into the cocktail. Once the chocolate to milk ratio is right, add the booze. For every 5 ounces of dairy, you will add 1 ounce of coffee liqueur and a 1/2 ounce of vanilla vodka. If you can find a mocha coffee liqueur, consider it a double bonus! It works beautifully for this cocktail. Then, transfer it into a hot beverage dispenser or a crockpot on warm and serve! Top off your spiked hot chocolate with a ridiculously hefty serving of whipped cream, marshmallows, crushed peppermint candy, or maybe even a candy cane for an extra special touch. Whichever way you choose to make or serve it, you can count on warm smiles and spirits to be raised! Please, enjoy. Perfect, spiked hot chocolate featuring an easy, homemade hot chocolate recipe with vanilla vodka, and Kahlua. In a medium-sized saucepan over medium heat, combine sugar, cocoa powder, salt, and water and whisk to combine. Allow mixture to come to a rapid simmer, and pour in milk and cream. Stir often until heated through. Remove from the heat. Add the vanilla and peppermint extract (if using), Kahlua and vanilla vodka, and stir once more. Ladle into a mug, top with whipped cream and crushed peppermint (if desired). Serve and enjoy. If you can find Peppermint-Mocha Kahlua, this can be used and the peppermint extract within this recipe can be omitted. 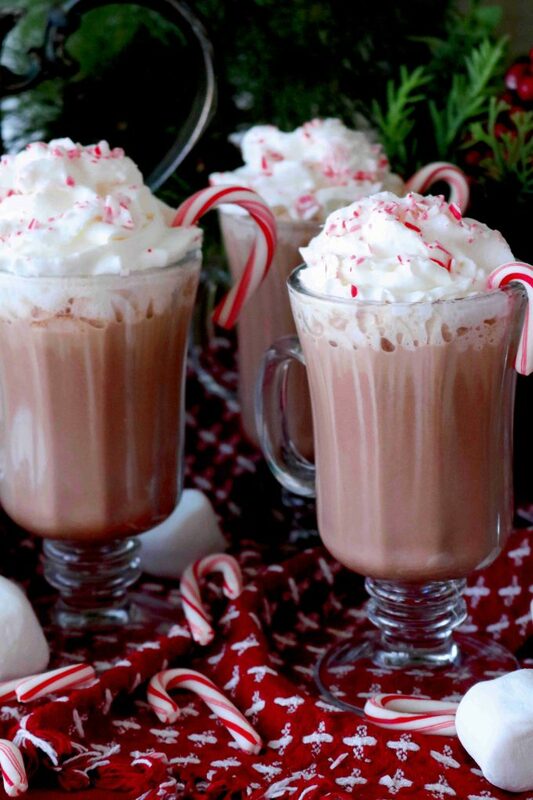 It’s still a bit too hot over here to be thinking about hot chocolate, but I love the combo of peppermint and chocolate and this looks amazing! I wonder if this would work chilled? Mmmm…. Spiked hot chocolate is the perfect drink for cold nights! Wow. 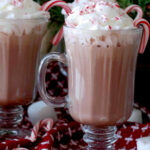 Never thought about spiking hot chocolate but what a great holiday drink and perfect for the upcoming cooler weather. Sounds like a great beverage to get me through the holidays. I will be saving this for the remainder of the year and into next. I want to come to your fancy shmancy party at Christmas!! 🙂 I adore this spiked hot chocolate and am going to try it this weekend when my niece comes over!! I have just added Kahlua and vanilla vodka to my booze list and saved this recipe… Whoa, I’m excited about this spiked hot chocolate! I’ll make my girls regular hot chocolate and spiked ones for my husband and myself! Thanks for sharing! Yum — I’m definitely making mine with Kahlua! This sounds delicious and so festive. Can’t wait to make this. It’d be perfect for a Christmas movie night. I’m always on the lookout for such recipes, as I love both a good hot chocolate and a good christmassy cocktail. I had never heard of whipped cream vodka! But you made me crave vanilla vodka. If you’re ever in Poland or have the possibility to buy Polish alcohol, I recommend Soplica vodka in the hazelnut flavour (orzech laskowy). It’s like nutella-flavoured vodka, it’s so good. It would totally make for a killer ingredient in one of the combinations for this spiked hot chocolate! I love this! I really liked that you added a foolproof ratio so we all can experiment with different kinds of booze! I actually didn’t know about the fact that fat helps with the burn of the alcohol. It’s nice to know all these things. And now I’m really craving one of these spiked hot chocolates! Spiked hot chocolate! Yum. this makes me want to put on cozy clothes and watch the snow fall while I sip on this deliciousness. Thanks for sharing. Spiked hot chocolate is my favorite Christmas drink after eggnog because Kahlua is my favorite liquor. This sounds so delicious. Love the whole festive treats around it. I love all the options for this Spiked Hot Chocolate! What a great use for leftover peppermint bark too! hot chocolate with vodka..I am sold! Love love love it! 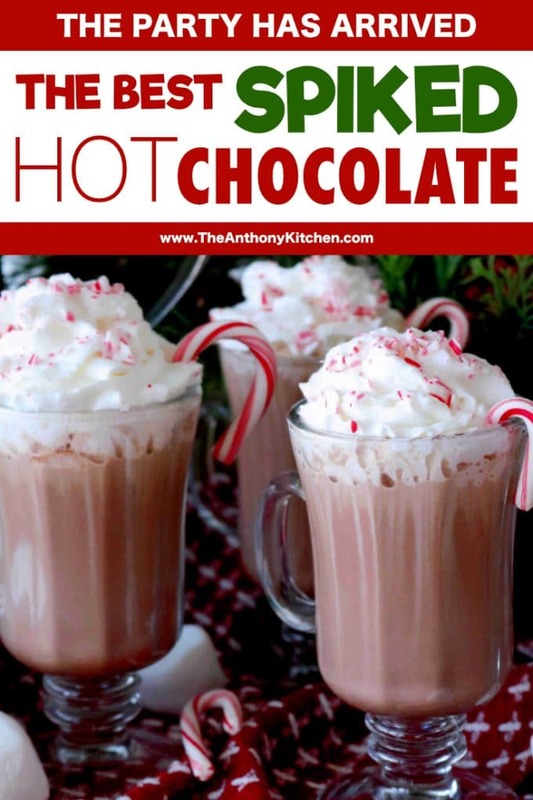 This sounds like the perfect hot chocolate to serve my party guests this holiday! I love being able to make drinks that spice up the holiday season. Same! Thanks so much, Jennifer! Definitely snuggling up with a mug of this tonight! So good! This is such a great idea! What do think about using bourbon? Will that be too overpowering? 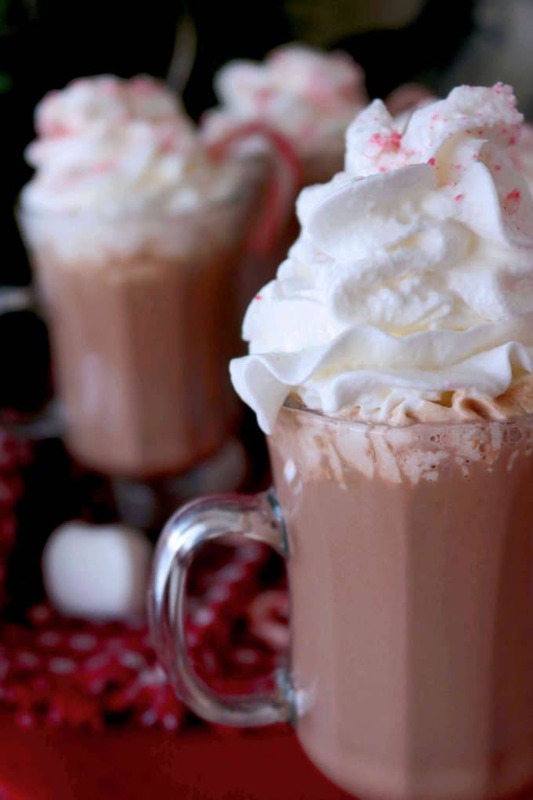 I love a good hot chocolate recipe and although I don’t drink I’d love to try chocolate peppermint for sure! What a great idea. Perfect holiday treat. This looks so beautiful too! We love hot chocolate but never had it spiked! Such great combo ideas you gave us. Thanks! That’s what I’m here for 😉 Thank you, Nicoletta! Oh, this is perfect! I was just talking to my boyfriend about what we should bring to our family’s Christmas dinner since all of the food items are accounted for. He suggested some sort of drink that everyone will like …and THIS IS IT! This sounds DELICIOUS! 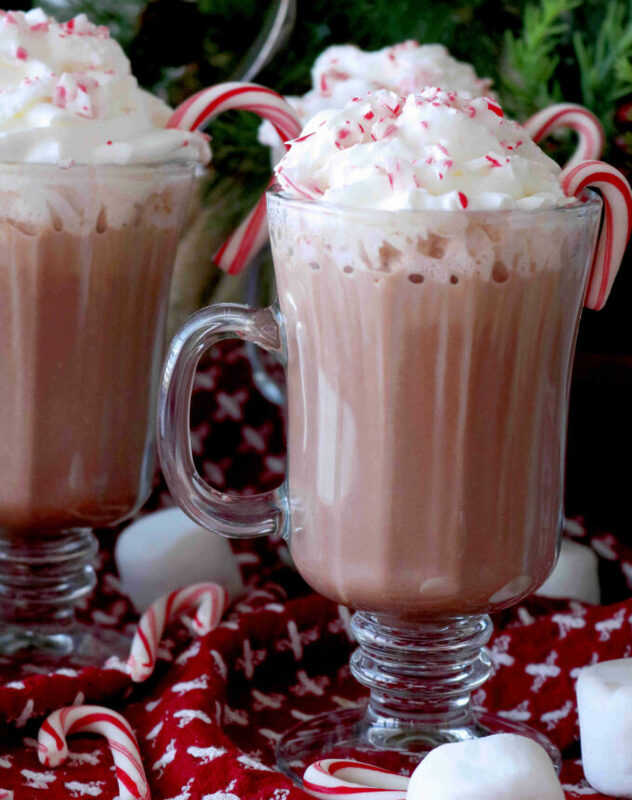 Spiked hot chocolate – yes please! What a great idea for a twist to make this an adult beverage! Pinned! I like your collection of Suggested Alcohols! You can really vary the taste! I love hot chocolate, but never thought of all those possibilities.